Senses were our gateway to fully enjoying each present moment during our pre-Christmas family vacation to Puerto Morales, Riviera Maya, Mexico. The 100 degree difference in temperature was our first clue that something was different. We left -20, and arrived to 80+ with high humidity. Once at our resort the children discovered coconut ice cream, fresh lemonade, and could still get the hamburgers they loved. Brightly colored flowers, deep blue sea and lazily waving trees and thatched roofs helped us enter a wonderful peace. My personal sensory smorgasbord awaited in our snorkeling excursion. It brought a brand new kind of peace, helping me overcome the panic I experienced the last time I donned the mask several years ago. Amancio, our tour guide, noticed my less-than-elegant attempts to manage my life vest, flippers, mask and mouthpiece and took me on as a special project. He recommended that I use the vest as a raft instead of being strangled by it. He put a film of toothpaste—yes toothpaste!—on the inside surface of my swim mask to prevent the fogging that messed me up the last time. He suggested that I just hold on—eventually I relaxed my death grip–and he towed me around the beautiful inlet. I would have missed the colorful fish along the way without his pointing them out. Entire schools of fish swam just beneath us. I reached out to touch them, but they slipped out of reach. When I relaxed enough to rest in the water, face down and ears in the water, a new sort of tranquility wrapped around my body and spirit. Interesting that most of my body was still above water, but my senses took in only the underwater world. I was able to inhale peace and exhale joy. The experience reminded me of the central role of senses in our existence. Stress melted away when I heard and felt only the unhurried world under the water’s surface. I did “run the tape” to save the experience to recall during future meditations at home. We also snorkeled in an ancient cave, with only natural light through the cave’s ceiling. Again, unusual sights, sounds and sensations filled my brain and spirit with unusual gifts that I was able to bring home with me. Amancio helped me overcome my apprehesion to again put my face with mask and mouthpiece into the water. My fear melted away as I entered the soothing world below me. He photographed the moment, and our driver photobombed the event. What a blessing this trip was for me. I thank God for this gift! EAU CLAIRE, Wis. (WEAU)– “Max Your Mind It’s a Faith Based book written to give hope. To help maturing individuals recognize and appreciate the gifts of growing older. It’s not all downhill from here,” says author Sandra Stanton. Searching since age 13 for an explanation of how the brain works, Stanton began her research during her Master’s Counseling program at UW Stout in 1977. “I explain it as ‘a good friend on my bookshelf’ type of a book. It’s meant to be a conversation piece that incorporates a humorous side of science,” says Stanton. The book is made up of 4 parts; brain, body, spirit and relationships. It’s available on Amazon.com, and in Eau Claire from the Local Store, BAM, and through www.SandraStantonAuthor.com for a signed copy. 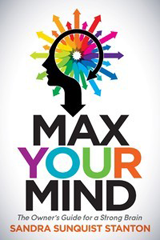 Max Your Mind was featured on WEAU-TV’s Today Show. Special thanks to Noelle for promoting the literary art of Chippewa Valley Local Authors! $40 will hold your spot and get you a signed copy of the book! Do you sometimes wonder what’s going on in babies’ precious little heads? The experiences parents choose for their baby shape her. What a responsibility! It’s always been a daunting task, one for which we don’t even get an operation manual. We have to figure it out for ourselves, often with the help of our own parents who learned long ago how to navigate in very different “waters”. Let’s look at some of the ways parenting has changed from the 70’s and 80’s to 2015. Today’s parents have the benefit of recent neuroscience research. We now know that full term babies have 100 Billion brain cells of which only 25% are connected to each other and functioning. The rest of the connections grow through the child’s experiences—engineered by parents and caregivers. When little ones feel safe and know that they are loved, they are eager to learn. Touch and loving eye contact create a sense of safety, giving them freedom to try new things. Don’t worry about spoiling a baby. They grow and develop best when they know that they matter to the grownups who care for them. We used to hear this from adults who were frustrated with noisy, distracting children. This philosophy downplayed the importance of interaction for babies’ brains. Ignored by their adults, many little ones felt isolated. Without interaction, children’s brains become stressed, restricting the formation of connections. Playpens were common in the 70’s and 80’s. With baby playing in an enclosed space, moms could get their work done, and they could still watch, talk and listen to the kids. Children were safe and entertained, but they couldn’t explore their world. Babies now often spend their time in carriers, experiencing their parents’ movements and activities. This is a far better way to create connections between the child’s brain cells. Parent and child are able to enjoy each other singing, dancing, and sharing activities. Parents are better able to become their child’s favorite “toy”. They love to study Mom’s or Dad’s face, and learn how to get smiles. Climbing into his world on the floor develops his brain and helps him learn about relationships. Children across time have learned by playing. In the 70’s they liked, trucks, dolls, and other toys. An entire generation grew up watching Sesame Street and Mr. Rogers. Sitting and reading the same book over and over together in a rocking chair has always been a wonderful way to help them explore relationships and learn about their world. In the past ten years, electronic options with bright moving visuals and engaging sounds keep children occupied and quiet, tempting busy parents to rely on them. For more “bang for the brain”, babies and toddlers need face-to-face interaction with a parent or consistent responsive caregiver. Examining a real leaf, empty boxes, plastic containers and other real-live experiences with their adults awakens their creativity, wonder, and teaches them to play. When either the parent or the child is focused on TV or other screens rather than each other, children miss out on critical development opportunities. Most important, the screen doesn’t respond to the child’s communication, so they learn they don’t matter. Babies are gifts—even when they keep us from sleeping. Find joy in your time together, and everyone will have a stronger brain. Contact Family Resource Center at 715-833 1735 to register for Building Baby’s Brain class on June 16, 2016 5:30-7:00.